Meliconi may not be that well-known a brand here, but it claims to have produced Europe's first universal remote control in 1992. This 6-in-1 controller sits at the lower end of its current range and has a build quality to suit its budget intentions. It's weighty and easy to grip but its anti-shock rubberised backing feels clammy in the hand. Its button arrangement is logically labelled and arranged, but suffers from having a few too many similarly sized pads - which can be a little counter-intuitive - especially in the dark, even when making use of the orange backlight. Still, each is responsive enough and there's a button for almost every function you could need, including dedicated Box Office and Sky buttons for Sky users. It's powered by two AA batteries and a small piece of paper glued to the inside the battery compartment can be used to note down the remote codes for your equipment. Don't expect to find such luxuries as internet-updateable code databases at this price. There is, however, an extensive printed list of codes included for most manufacturers, including some of the more obscure brands out there. The easiest way to assume control of a device is to pick from one of the corresponding buttons for device type: TV, Sat, VCR, Aux, Terr, DVD, hold it down for five seconds until it flashes, then enter the remote code and jab the play or power buttons until the target device responds. Programming it for Sky Plus control requires entering separate codes for the box and its PVR functions. If you don't have the code you need the Light 6 can learn it from the device's remote control. If the latter has a feature not covered by the Light 6 it can learn this too and map it to one of the four function keys. It can be used even to control an iPod (presumably when docked with your hi-fi, not in your pocket). 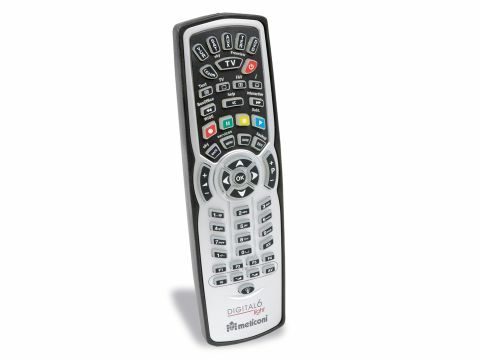 Aside from not having to juggle five remotes at a time, the other benefit common to many universal remote controls is the ability to define 'macros' - a selection of automatic key presses that will, say, turn on your TV and sat receiver and switch to your favourite channel. Details on how to set up this feature are strangely omitted from the printed instructions but are covered in the supplied instruction CD. Up to 85 macros (here called 'MEMOS') can be created and assigned to a single button with a limit of up to 32 button presses for each. These are retained in the remote's memory even if the batteries need changing. It may not have the hi-tech smarts of a Harmony or high-end One For All controller, but the Light 6 is easy to program and performs effectively on all fronts, making it a compelling reason to consign most of your other remotes to a drawer for a more minimal AV life.